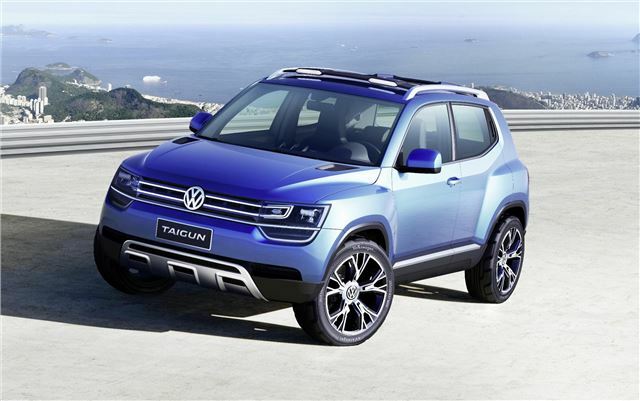 Volkswagen has shown its intention to enter the compact SUV market with the Taigun, a sub Tiguan size Up based SUV to compete against the Ford EcoBoost. Unveiled at the São Paulo motor show the Volkswagen Taigun is 3.86 metres long and 1.73 metres wide, but on a generous 2.47 metre wheelbase. This gives the Taigun short overhangs (708 mm front and 681 mm rear) and , while the sculpted bonnet styling follows the current Volkswagen Tiguan and Touareg look. The Taigun is powered by a new 1.0-litre, three-cylinder turbocharged petrol engine producing 110PS at 5,000 rpm with 175Nm (129 lbs ft) of torque sent through a six-speed manual gearbox. The engine is based on the latest EA211 series, and with the use of direct fuel injection and turbocharging it is able to return a combined fuel consumption of just 4.7 litres per 100km (60.1 mpg), despite being able to take the 985 kg Taigun from zero to 62 mph in 9.2 seconds and on to 186 km/h (115 mph) top speed. Wide tracks (1,473 mm front and rear) help give the Taigun a purposeful look. The showcar is on 17-inch alloys with 205/50 R17 tyres which, combined with high ground clearance and the 175Nm torque enable it to deal with rough surfaces. The high driving position gives the driver an optimum view in traffic. Luggage capacity is 280-litres increasing to 987 litres with the rear seats down. The tailgate is split horizontally, with the top two-thirds opening upwards and the bottom third folding down. Taigun interior headroom is 1,036 mm in front and 980 mm at the back, with controls pared back to a minimum. The front air nozzles, for example, not only individually control the direction of the air flow, but also the blower speed and the temperature, which is displayed within the nozzle. Meanwhile the central infotainment system can pair with the majority of smartphones, providing an intuitive interface. Above this are mounted auxiliary instrument gauges that display oil pressure, coolant temperature and turbo charge pressure. Volkswagen's plans for the Taigun, Tiguan and Touareg obviously follow those of Ford with the EcoSport, Kuga and Edge which are similarly offered as a world market SUV range.